ABERDEEN PROVING GROUND, Md. 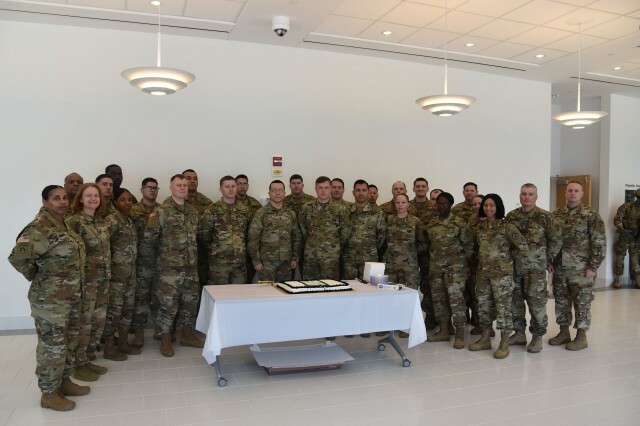 -- The U.S. Army Test and Evaluation Command's (ATEC) newest sergeants were inducted into the Army Noncommissioned Officer (NCO) Corps during ATEC's NCO Induction Ceremony on Aberdeen Proving Ground Mar. 22. 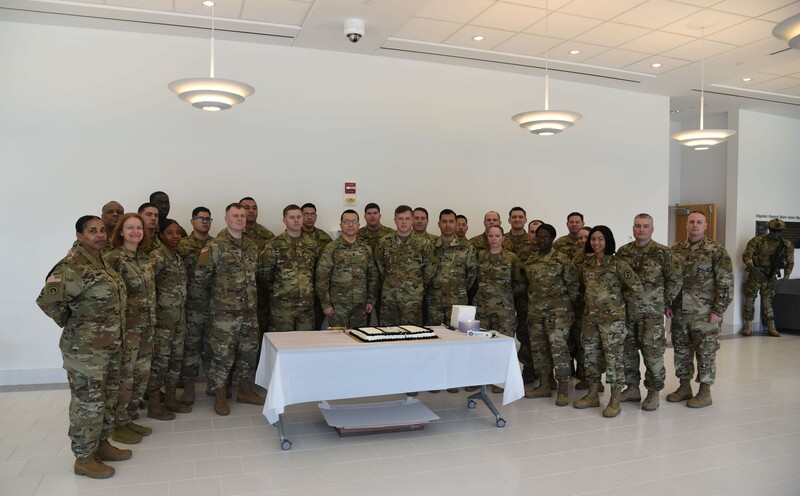 The purpose of the Army NCO Induction Ceremony is to celebrate the transition of a Soldier to a leader as they join the ranks of a professional NCO corps. Induction allows fellow NCOs of a unit to form a cohesive bond and support team development. The importance of recognizing a Soldier's transition to NCO should be shared among superiors, peers and newly promoted Soldiers. Command Sgt. Maj. Jon Helring, ATEC, and Sgt. Maj. Malisha Palmer, U.S. Army Public Health Command, hosted the ceremony. Sgt. 1st Class Jason Wambolt, ATEC operations NCO, served as the master of ceremonies and gave the opening remarks. Before the new sergeants were inducted into the corps, Helring and Palmer presented 1st Sgt. (Ret) Sonya Helring, 1st Sgt. (Ret) Timothy Schickedanz and Sgt. 1st Class (Ret) Jerry Szymczyk with tokens of appreciation for their service. "Today, we recognize this rite of passage as a transitioning point in a Soldier's life," Wambolt said. "We acknowledge that our primary duty is now to train and lead Soldiers regardless of our military occupational specialty. It also serves as an opportunity to honor the memories of those men and women who served with pride and distinction as sergeants." 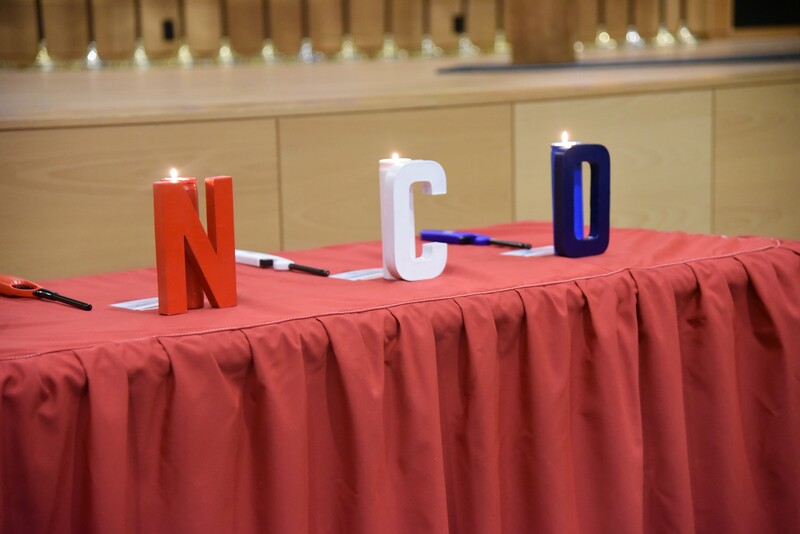 Prior to the new sergeants' induction, a candle lighting ceremony took place symbolizing an important part of military history and the NCO Corps. At the completion of the lighting ceremony, Command Sgt. Maj. Helring took the stage to recognize nine year old Jaydan Hammond who aspires to join the military in the future. "Today we are honored to host a young man who committed his heart and word to the United States military when he was two years old," Helring said. "A second grader at Edgewood Elementary, he has passion and drive that will undoubtedly ensure that one day he becomes a part of the brotherhood and sisterhood of Soldiers." Hammond was presented gifts to motivate him to pursue his ultimate goal of serving in the military. After the gift presentation, Command Sgt. Maj. Frank Gutierrez, U.S. Army Communications-Electronics Command, addressed the new inductees. He expressed the importance of the new sergeants understanding their responsibility to lead junior Soldiers under them. "This is an undertaking like no other," Gutierrez said. "As you become more senior, you realize the level of expectations grow. The level of responsibilities grow, and so does the must in your ability to become more adaptable and more agile as you become more senior." Gutierrez concluded by challenging the inductees to remember why they wear their new rank as sergeant. "The rank you wear, you don't wear for yourself," Gutierrez said. "You wear it for those who don't have a voice. As you become more seasoned, you'll realize your rank represents the blood, sweat and tears of every Soldier, officer and civilian who's ever been part of your units both past and present." Following the guest speaker, junior Soldiers in the audience rose from their seats one at a time to recite their portion of a poem entitled "A Soldier's Request." This poem is intended to be a petition from all lower-enlisted service-members for the newly promoted sergeants to train, support, motivate, teach and mentor them. At the conclusion of the poem, the new sergeants walked up to the stage to become formally inducted into the Army NCO Corps. The new ATEC inductees were: Sgt. Robert Burke, Sgt. Mano Naama S. Burnett, Staff Sgt. Mark Chuisano, Staff Sgt. Joseph Erwin, Staff Sgt. Grant S Heller, Sgt. Sarah B. Jones, Staff Sgt. Benjamin Line, Staff Sgt. Michael Mulligan, Sgt. Jean Perez, Staff Sgt. Alberto J. Rivera, Sgt. Michael B. Trigleth, Sgt. Charlie B. Jaramillo Valencia, Sgt. Aisea Vave, Sgt. Kevin Won, and Staff Sgt. Michael Zamora. Perez then stood before his fellow inductees to lead them in the reciting of the NCO Creed. Following Perez, U.S. Army Evaluation Center's Sgt. Maj. Michael Goodman led the new inductees in reciting the NCO Charge. A cake cutting ceremony took place to commemorate the special occasion. Gutierrez and one of the new inductees were given the honor of cutting the cake. At the conclusion of the induction ceremony, friends, family and peers congratulated the new inductees as they entered a new chapter of military leadership.